My writing process | Vincent Cannataro, Ph.D.
Amanda Niehaus (PhD) is a writer and scientist based in Brisbane, Australia. Her work spans the academic, nonfiction and fiction worlds – and she’s doing her best to integrate the 3. Amanda has been published in Peppermint Magazine, on pillows at the 2013 Brisbane Writers’ Festival, and you can find her online at Easy Peasy Organic (http://www.easypeasyorganic.com), Minimal Worries (http://www.minimalworries.com) and Staying Alive (http://www.easypeasyscience.com) as well as on Twitter as @EasyPeasyOrganc. I met Amanda at the Evolution and Cancer conference in San Fransisco this last summer. Before knowing about her blogging expertise I let the beans spill that I was thinking about starting a blog (I had a lot of fun putting together a video about some research, I enjoy teaching and sharing the things we learn about our world through science, etc etc) and she told me to run with it. So here we are! Thanks Amanda. Before I get to the meat of the post on writing, let me just say this: I don’t consider myself a writer. Which is silly, because I just wrote that (typed that? ), doesn’t that make me a writer? I don’t know. I don’t consider myself a swimmer, but I like going to the beach and jumping in the ocean. It’s good exercise and it’s enjoyable. Just like this blog, and this post. Although, today I spent all day writing up some results from my research and now I’m writing about writing, so maybe it’s time I reevaluate myself. Thanks again, Amanda. Right now I’m taking a quick break from writing my first first-author paper to write this post. It’s really exciting and nerve-racking, and it’s embarrassing how slow the words come off my fingers. But it’s getting easier every day. My research is on the evolution that takes place within multicellular organisms as they age. How mutations can accumulate in the little pools of stem cells that are constantly dividing to maintain your body. I think it’s a wonderful story and I can’t wait to share it with others. Well, my science work is novel research. As for my blog, I don’t know. I honestly didn’t purposefully read any blogs before starting this one. I still don’t. I should start reading blogs! I don’t even know what my genre is. I’m the type of person who goes to look something up on Wikipedia and, an hour later, finds 16 tabs open because I clicked every link along the way. I guess I just think a lot of things are cool and I want to learn about them. And I like telling people about these things. I like to tell stories. Where I’m writing from right now. 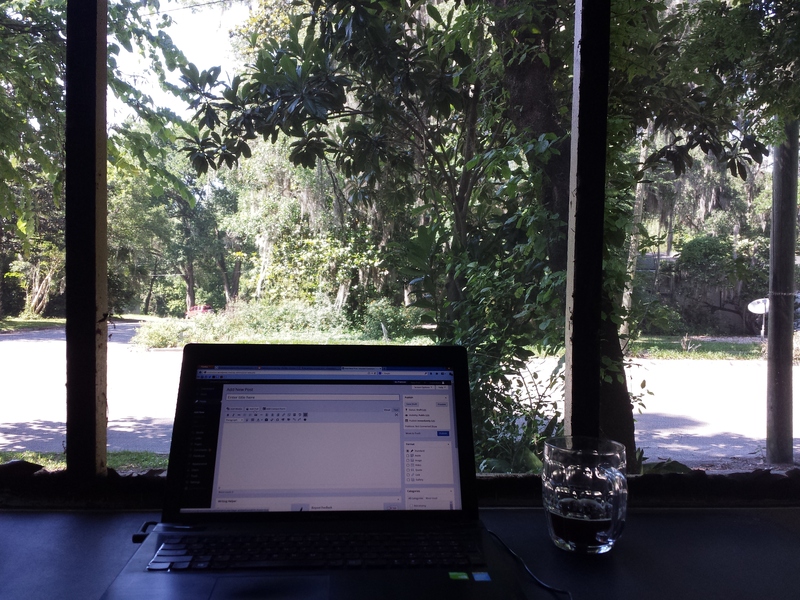 Front porch and a homebrew, Gainesville, FL. So far this blog has been a perfect storm of daydreaming and procrastination. I’ll typically learn about something, like the Voyager mission, or think about something, like the concept of a species, or want to share something, like pictures of spiders or eclipses, and if the feeling is perfect (just got to a coffee shop, but can’t bring myself to do actual work yet) I’ll start typing. And thus, just like 99% of all the species that have existed on Earth, my writing process blog post lineage comes to an end. I’m glad that Amanda had a fitness greater than 1 on her post, so she has lineages which can still carry on her story. All of the folks I asked to continue my post lineage couldn’t. Do you want to write a blog post about your writing process? Feel free to continue off of this one! This entry was posted in Uncategorized and tagged writing, writing process. Bookmark the permalink. I have FITNESS! woo hoo! I like your view on being a writer – like being a “swimmer”. What does the label really mean? How does it define us? Does it take away from the enjoyment somehow? And homebrew! I was thinking about doing a “science of brewing” post or series of posts. I’ll keep you in the loop. It’s a new fun (and rewarding) hobby.